A House Transformed for Christmas. This is my favorite house in Pike County,Missouri. Home of Haines and Marilyn Moss.It is an 1861 Italian Villa style. Two of my Dearest friends and Neighbors, are Haines and Marilyn Moss. They live 9 miles up the road in Louisiana,Mo. In 2008, when the Mississippi River flooded and threatened to take, My Old Historic House,Haines worked endlessly helping me fight, to save it. He spent many nights, all night long, setting up with me, watching pumps. This kind of friendship is hard to find and it meant the world to me. Before I bought, My Old Historic House, I was looking for an old historic house to buy. My favorite house was one I could not afford. The price was way over my head and the cost of maintaining it would have been more than I could ever handle. This house was bought by my friends,Haines and Marilyn, even though I did not really know them at this time. They had an Antique shop in Louisiana and of course, I had to go in often and look and buy stuff.. I never could resist an antique shop. 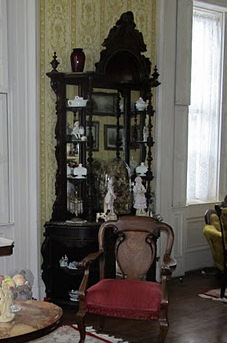 Haines sister, Nancy, also had an antique shop in Louisiana. I got to know her from the shop, but gained more of a friendship when I was having an estate sale,before I bought my house. I had a small cottage in Clarksville, where I spent the weekends. I had to sell it, in order to buy my big old historic house. The cottage was decorated kinda country, shabby and cottage like. I did not want to decorate the new house that way, so I had a sale to sell that stuff. Nancy came, bought truck loads, in fact she made a couple of trips. We became friends and then I meet Haines and Marilyn through her. One thing we all have in common, besides a love of antiques, is that we all have big old historic houses. After that, the rest is history, and we all have been the best of friends ever since.Marilyn often comes and gives me a hand when I have tours. She looks so beautiful in her Ante- Bellum ball gowns. This is my beautiful friend Marilyn, who so generously helps me when I have tours of, My Old Historic House. Haine's and Marilyn's house is an 1860 Italian Villa with a tower. It is painted brick and has beautiful double arched windows. The roof is very low hipped, which makes it appear flat, the designer did not want the roof to take away from the houses detail. The over hangs are beautiful and look like trim on a wedding cake, as the lintels and brackets are so big and massive. The inside of the house is just as wonderful. It features a double entrance hall. The second hall has a wonderful flying curved staircase, sweeping up two floors with no supports visible. 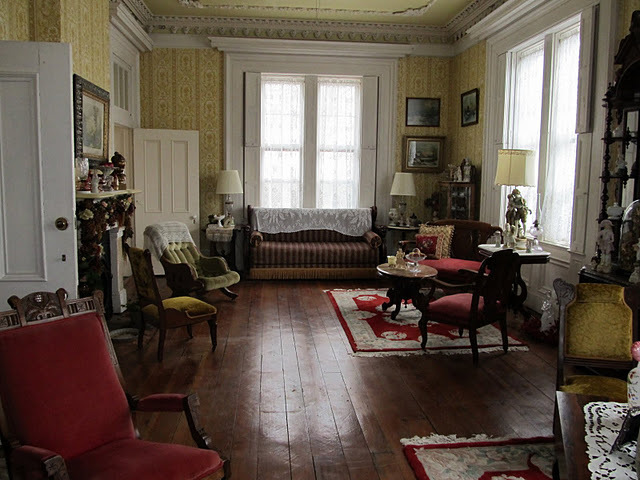 The house has 11 fireplaces and each interior window has the original shutters. The ball room has two fireplaces and has the most amazing plaster work details on the ceiling. The ceilings on the first floor are 12 feet tall and 14 feet on the second. Original hand grained woodwork is in tact in most of the rooms. It is a real masterpiece. My Bestest., Nancy - Haines sister. We antique shop together all the time. My friends have lived in the house now awhile and Marilyn thought it was time for a make over. What better time to do it than Christmas. At the same time ,she wanted to decorate the house for the Holidays. When they moved into this house they brought there furniture and things, that they had in there former house ,with them. They really never bought to much, just for this house. Most of there furnishings were antique and ranged in many styles. They were all with in the right age limits for this house. Some being from the late 19th century and others from the early 20th century. To make all this take place in a timely manner, Haines and Marilyn set dates for a couple of Christmas parties. Marilyn called me and asked me if I would help. Of course I said yes, I love them, love the house and I just had to do it. I know- I know- they both might have been a little sorry they asked me to help. I am a mess, I will be the first to admit it. I never seem to be the one to take the easy road., it is the long way or no way. So I think I got,well I know I did,carried away and moved 90 percent of the things on there first floor. Oh boy, what did I do? I think it was worth it in the long run. Of course ,I would think that. But to see Marilyn's beautiful happy face, made it all worth while. We used mostly what they had. We did add 2 rolls of red satin floral ribbon and some new little white lights and a few green garlands. All there Christmas decorations from the past were brought out and I sorted through them to see what I wanted to use. A few things meant a lot to them, so I made an effort to put them in prime spots. 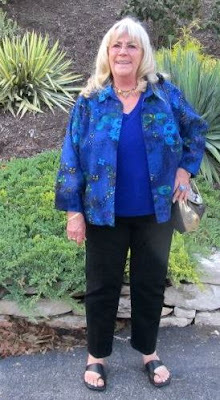 Marilyn had already decorated a beautiful 10 foot tree, it was full of wonderful vintage and favorite family ornaments. It was the one thing that Haines had asked that we did not change or move. 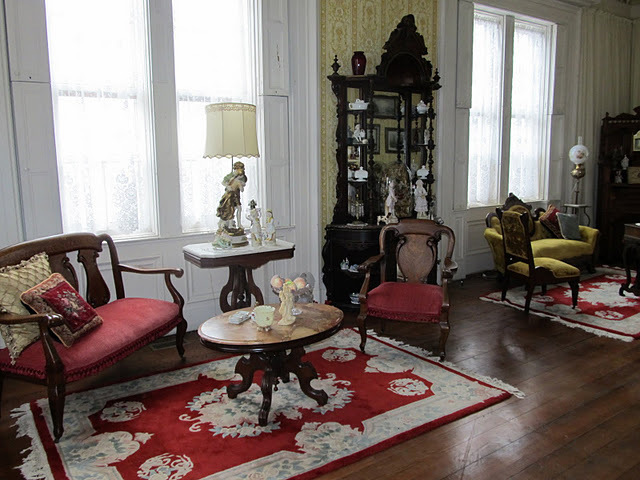 Furniture from the parlor was put into the dining room. Furniture from the dining room was used in the ballroom. Some of the ballroom furniture was used in the parlor. The parlor took on more of a library look as I placed a oak antique library table in the middle of the room. The huge entrance hall was one of my biggest challenges. Having no where else to store furniture, meant that it all had to be used. I wanted to blend styles and balance scale. Big rooms with tall ceilings are easy, but smaller rooms with tall ceilings, are not. These rooms require tall pieces with some weight to make the space work. Another thing I worked on was the lighting. I feel it is very important to balance a room with points of light. Most rooms, except maybe a dining room, relay on lamps for lighting, instead of an over head chandelier. Any time you use a room in the dark evening, it is very important that you can see, yet not blind yourself ,from one point to the other. So we moved lamps, changed wattage and added a few lamps . The final test is to turn them all on and walk and set around the room, and see how balanced it is. I think we did a pretty good job with this challenge. The beautiful ball room ceiling with the elaborate plaster work. Four fireplaces were decorated for Christmas. I moved everything off each one of them and started from scratch. Marilyn loves her pretty things, and wants them all out where she can see them. This is not a bad thing, except when you add a bunch of Christmas decorations, you have to wonder which ones to look at first. Thinking about what might have been available in the middle 1800's I thought of greenery, sticks and ornaments. We had to do the decorating early and leave it for two parties, so we chose to use the fake greenery. I went on a hunting trip, armed with my snipers and returned with a big pile of beautiful ,bear, tree limps. These limbs became a common theme and were used in all the rooms. And they were free. On the parlor (library) mantle I places a tall mantle clock, that was on the family room mantle on the second floor. I also added a beautiful red satin glass gone with the wind lamp. When lite, it makes the most wonderful red glow about that room. I added books,a brass skaters lantern,brass candlesticks, a pair of ceramic quail and a dancing black doll . Marilyn had some beautiful floral garlands, I think they were a gift from her daughter, that she used on all four of the first floor fireplaces. They were special to her, so I wanted to incorporate them into my design.I added my sticks, green garlands, white light, re -arranged the floral garlands and the mantle was transformed for Christmas. One tip, I cut small pieces of the garland and wrapped around the bare tree limbs and it gave them a feeling of being pine limbs. Again costing nothing. To top it all off, I added some red satin bows. You have to realize ,that all the furniture, that is now in the parlor (library), was once in the ball room. So we then moved to the ballroom, for our next big challenge and transformation. There are two items in the ballroom that are both magnificent. One is a Victorian Brides Dome and the other is, a impressive Rosewood Etagere.The wedding dome was setting on the etagere . The two best things, right there together. One was fighting the other for importance. My goal was to move them apart and highlight each one. I found a sofa table in the dining room,it was moved to the ballroom and used as a console. I placed the wedding dome on it, under a pair of arched windows and put a pair of crystal lamps on each side of it. It was such a transformation,I felt like doing a cart wheel. The dome was highlighted and it made the statement, just as it was intended to do. I found several bisque statues of children, all over the house, and I used them to accessorize the etagere. But, the crowning glory was the massive floral arrangement ,I did atop the etagere, with sticks, greenery and bows. This made this wonderful piece of furniture now seem to be, the best thing in the room, which it was. The double mantles in this room were garlanded, lite and decorated with sticks,ornaments with a musical theme and a nativity.All the furniture was pulled forward, accessories were chosen and placed, and the ballroom transformation was complete. Moving on to the entrance hall was our next project. This is such a beautiful space. It has not only one of the most beautiful staircases in the world, but also, one of the biggest and most impressive mirrors, I have ever seen. It is a piece, that would make you think about robbing a bank to own. It came with the house. It is 12 foot tall and 6 foot across and made from rosewood. It has a small marble topped shelf down at the bottom. Because of the size of the mirror and the size of the shelf, it creates a problem with what to put on the shelf. I found a large blue oriental vase, about 3 foot tall ,and within a few minutes ,I had created a big impressive floral arrangement. Again I used my free sticks, some greenery garlands, peacock feathers and some silk floral vines that Marilyn had in a flower pot. As I mentioned before ,I was not to touch the Christmas tree, but, after asking permission, I was granted the use of 4 beautiful peacock ornaments from the tree. They added a little glitz and it is amazing how the catch the light and change colors. 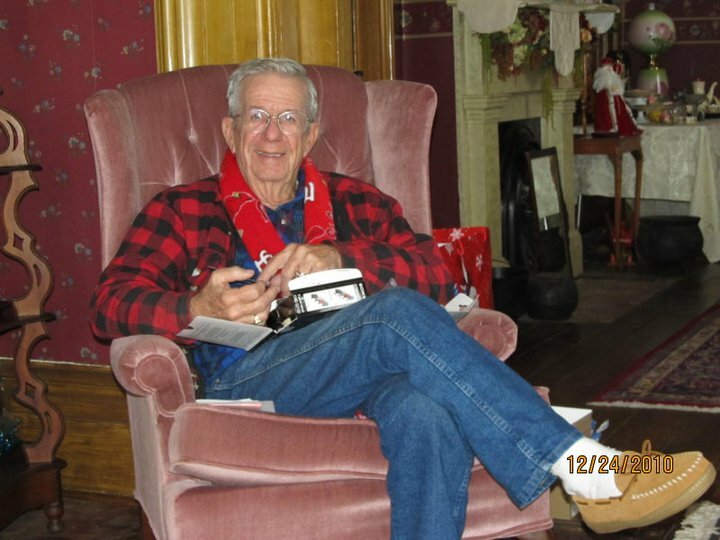 Some of Haines's favorite Christmas items were displayed on a large china cabinet. A love seat that was used in the ballroom, was moved in the hall. The area under the stairs was not quite up to par. So we added a skirted round table, a feather tree, some candles and the three kings, that were hand made by Marilyn's mother, many years ago.The stairs were garlanded and lite and the grand entrance hall was complete. Another transformation done. The dinning room is the last room, in our makeover- transformation. This room is where all the old Christmas decorations were placed, till we could see what we wanted to use. Also the place we put everything else we did not use in the other rooms. So,our work was cut out for us. After sorting, storing and cleaning up, we were ready to do our magic on this space. On the fireplace in this room , there is a beautiful three piece German Dresden mantle set, composed of a pair of candlelabra and a compote . Above the mantle was a gold mirror. We left all these and I placed green garland across the mantle and up the mirror, swagged across and back down. Small white lights were again added to the greenery and the floral garland below. Three bright red ornaments were hung from the top of the mirror along with satin bows and a few more red ornaments. This mantle has a complete different look from the other three, but is still very elegant. Marilyn plans on serving deserts and Hors D 'oeuvres on the dining room table. We placed a side table beside the fireplace, to serve the drinks from. These tables need to be pretty free from clutter, as they will be actually used.To finish the dining room transformation we added a white damask table cloth to the floor.Down the center I used some red velvet yardage, tied at each end with some beautiful red silk tassels.I used the red satin floral ribbon to adorn the tables four corners.Streamers were taken from each corner to the arms of the crystal chandelier above. The finishing touches were pretty red satin bows. The side table was skirted and a favorite brass candle holder was used as a point of light.Marilyn and I picked out several pretty antique serving pieces, including a big cut glass punch bowl, there will actually be used for food at the party. With all this in place, the dining room had been transformed as well. Now, all that is left is wait till the big date when the party will take place. WE had everything cleaned up and in it's place, so I could take some pictures to share with you. I am so happy that Haines and Marilyn agreed to let me do this blog. I am so happy to be able to share this beautiful home with all of you. What better way to start the Holiday season with a festive house tour. Please drop by for a look, and don't forget to leave your comments. I am so excited to hear from you all. I am sure I could arrange a personal tour, just let me know. HAVE FUN!!! WELCOME TO THE MOSS HOUSE, CHRISTMAS TRANSFORMATION. BEFORE: This is the parlor (library) before we started the transformation. Marilyn already had the beautiful 10 foot Christmas tree. Be sure and notice the furniture as it is now, and in the after picture it will all be different. AFTER: This is the parlor (library) after the transformation. Furniture from the ball room was brought into the room while this furniture was used in the dining room. This beautiful, large antiqur sofa used to be in the ball room. I thought it was very manly and would look nice in this room. This antique hanging lamp was found in a storage room. We needed a point of light here and there was no room for a table and lamp, so this was our solution. It is so beautiful and so sad it was not on display. I added a lot of books to the mantle transformation. This antique red satin glass, Gone with Wind Lamp , cast a nice soft glow about the room. Not usually found on a mantle, but seems to work here. These pink creatures are some of Haines and Marilyn's favorite things. I just love them in this flock . This library table was brought in from the dining room. Books, miniature oil lamps and another Gone With the wind lamp completes the look. This piece belonged to Haine's mother and it was a favorite of hers. Some of the vintage and family Christmas ornaments. I was given strict orders not to touch or move this tree, It is a beauty. BEFORE: The ballroom when we started the Christmas transformation. BEFORE: The ballroom showing the rosewood etagere and wedding dome. AFTER: The ballroom after the Christmas Transformation. AFTER: Ballroom Etagere transformed for Christmas. The new placement of the wedding dome. One of the two ball room fireplace mantles. 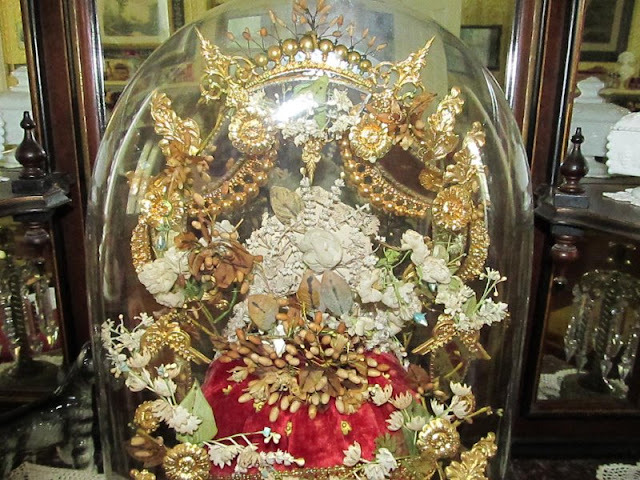 Both are decorated with Nativity pieces. A pair of Lambrequens were hand made by one of Marilyn's friends. This is a favorite piece. This is one of many antique Chandler prints found in the ballroom, I thought this winter scene was a nice background for Christmas decorations. Another beautiful hand pained Gone With the Wind oil lamp in the ballroom. BEFORE: Grand Entrance hall, notice the furniture under the stairs. AFTER: Grand entrance hall after the Christmas transformation. We moved everything from under the stairs and added a skirted table. Three Kings hand made by Marilyn's Mother many years ago were placed under an antique feather tree. These items are some of Haine's favorite. These peacocks were from Marilyn's tree. Here you can get an ideal how big and grand this rosewood mirror in the entrance hall is. It is 12 foot tall and 6 foot across. I added an arrangement of sticks, pine and peacock feathers to a three foot tall oriental vase. Antique dolls in an old wicker sled. We garlanded the stairs and added colored lights and bows. The tapestry was here, I moved this gold velvet love seat from the ballroom into here. 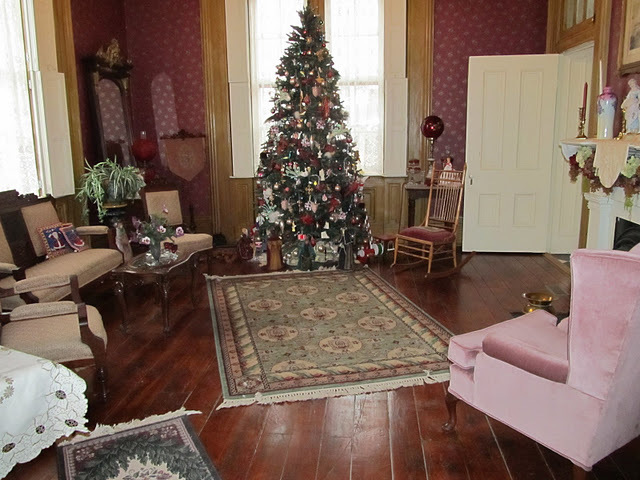 Even the antique hall tree in the entrance hall is all decked out for Christmas. BEFORE: This is the dining room as it looked when we started. The dining room table ready for the party. The floral garlands were a gift to Marilyn from her daughter.